I am sometimes asked what one Australian UAP case has intrigued me the most. My answer, is that it was one that happened on 4 February 1973 at Kimba, South Australia. This case first came to light through a newspaper clipping from the “Whyalla News” newspaper of 16 Feb. 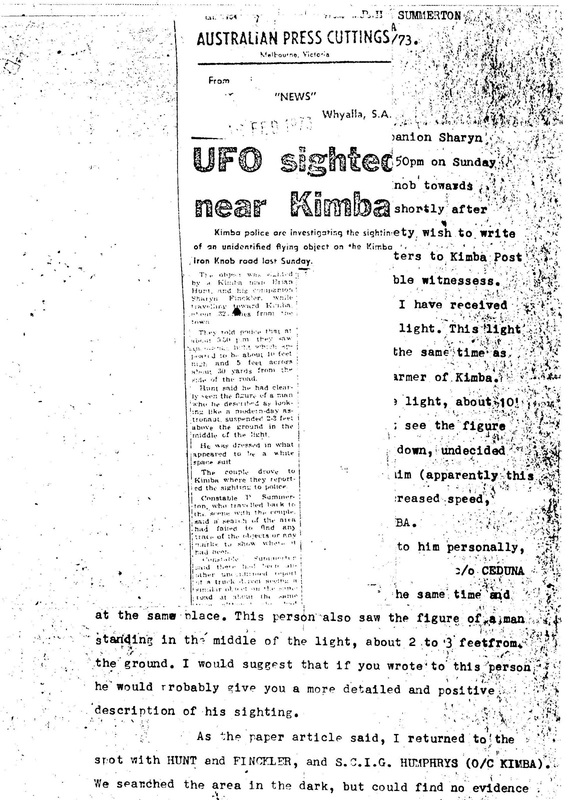 The story didn’t reach us until 24 Feb. We telephoned Mr. H. in Kimba, one of the witnesses, but he wasn’t available. A reply paid telegram was sent and a reply received. Finally, we made arrangements to interview Mr. H. and Miss F. on 3 Mar. 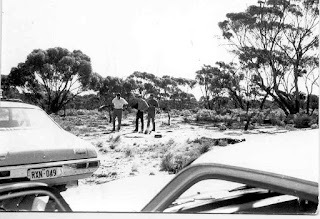 The investigation team, which headed to Kimba, consisted of myself, Ray Brooke, Dean Piovesan and Peter Powell. On the road between Iron Knob and Kimba we stopped at the sighting location. The terrain consisted of flat land, with three to six metre high trees and smaller scrub set in a deep-reddish-orange coloured, dry soil. A barbed wire fence line lay some twenty to thirty metres from, and parallel to, the road at this point. Visibility was limited to about fifty to one hundred metres into the scrub, depending on your angle of vision with respect to the trees. 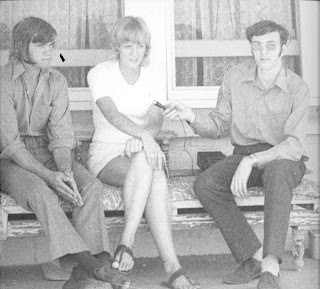 We then travelled into Kimba and firstly called on Miss F. Her father confirmed that on the night in question the couple had returned there are about 10.30 p.m. He had noticed that Mr. H. was white faced and trembling so much that he was unable to light a cigarette for himself. The couple had then related the occurrence, as a result of which the police were contacted. We then made a telephone call to the local police constable, constable Summerton. His wife answered and suggested that her husband come over to join us. When he had arrived, the young couple again related what had occurred on the night in question. The events relating to the police participation were confirmed by the constable. He advised us that he had been out to the site and inspected it, but had found no evidence on which to base a conclusion. The couple we interviewed, Mr. H. and Miss F., were travelling together in one car. In front of them, as later determined, was a Mr. I. Following both cars was a semi-trailer driven by a Mr. D.
Firstly, the young couple. They were driving between Port Pirie and Kimba, and the incident occurred some kilometres out of Kimba. Mr. H., who was driving, noticed what he at first called a red flare, to their right and forward, just off the road in a clearing. As he passed he had a brief look at what was there. 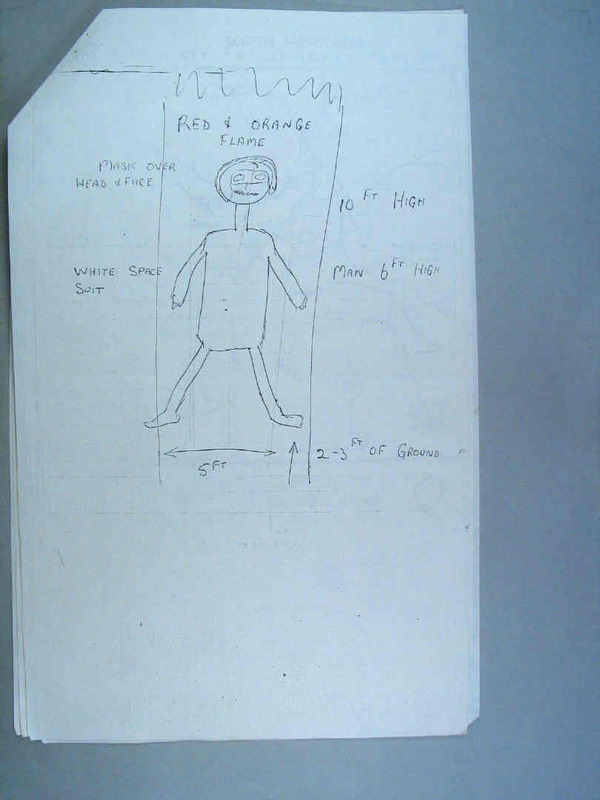 He reported seeing a rectangular shape, orange-red in colour, three metres high by one point five metres wide, with a sharply defined figure in what he called a “white spacesuit”, floating in the middle of the shape. 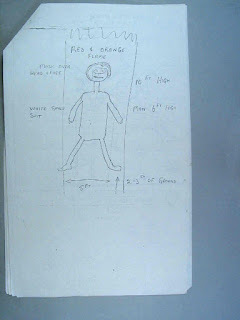 Below is a sketch drawn for Constable Summerton by Mr H.
This figure looked like an ordinary human being in respect of shape and outline; and appeared to be motionless a metre or so above the ground, with a metre of orange colour below him. His arms and legs were pointing slightly downwards, covered all over in white. It should be remembered that this description is based on, at the most, a two to three second observation. The driver accelerated the car from the ninety km/hr he had been doing. At the same time he motioned Miss F’s attention to their right. It was some seconds before she understood, but then she turned in the seat to look. She related that she saw a deep orange coloured, rectangular shaped thing, with a white blob on top of it, in the clearing. She turned around to comment on it and, upon turning back, observed that the orange glow now appeared to extend right across the road behind them. Several seconds later she looked again, but they had gone over a slight rise and nothing was now to be seen. At this time Mr. H. had been concentrating on driving. The couple drove to Miss F’s house in Kimba. Her father heard the story, and shortly afterwards the local police were called. Police Constable Peter Summerton attended the call, and took the couple back out to the clearing. The three arrived back there by 11.10 p.m. and they undertook a good look around. The ground was searched for tracks but none of any kind could be found. No evidence for a hoax was evident. In the days that followed, a truck driver related to the Kimba police that he had passed the same spot at about 10 p.m. He said that inside the fence line there was something which had appeared to be a brightly lit “caravan doorway,” except that it was much taller than a normal doorway; giving it a rectangular shape that was twice as high as wide. It had a white, outlined shaped inside it. He did not stop to take a look. Mr. H. related that a car had passed them just prior to their reaching the clearing. The driver of this vehicle, when located, says that as he passed the clearing he saw: “A glow of light, rectangular shaped, orange in colour,” which would have been, a chain or two outside the normal fence line. 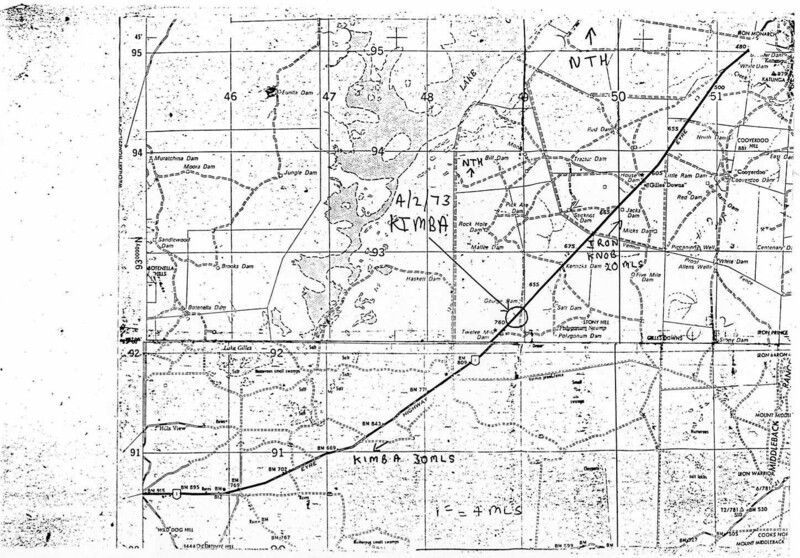 Constable Summerton produced his notebook and advised us of the details he had noted down that night, including a sketch of the object and the “man” as drawn by Mr. H. Two other people had subsequently reported to him that they had also seen the same or similar object on the same stretch of road that night. 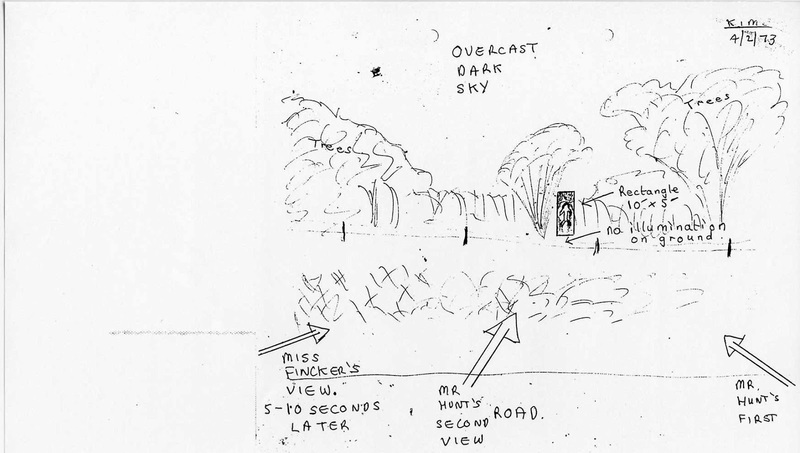 His notebook showed that a Mr. D., the semi-trailer driver, confirmed that he passed the clearing at about 10 p.m. that evening; that he had noted a large”caravan doorway” with a figure in it, in the middle; and that there were no sides, top or bottom, to this doorway as a normal caravan would have. He had not stopped at all. Mr. I. the driver of the second car, stated in a letter to us, that he saw an orange glow on the right hand side of the road. 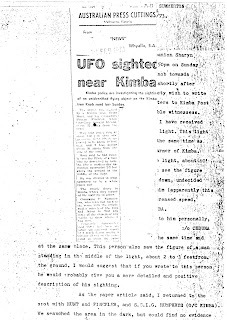 It was a: “Glow of light , rectangular shape, orange in colour.” He said he would have placed the clearing some fifty to fifty two kilometres out of Kimba. The couple, after seeing the object, stated they had travelled about three kilometres before they saw a signpost saying fifty kilometres to Kimba and they considered their location accurate. He wrote that he thought it could have been an accident so slowed down. 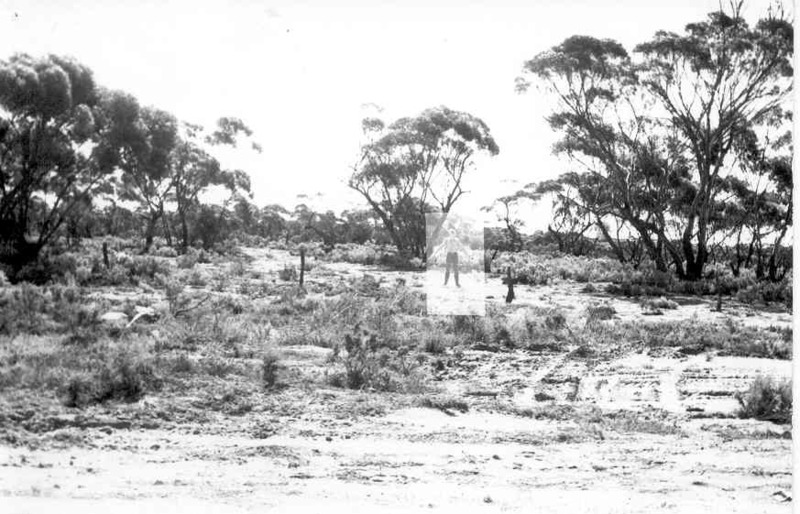 He realised that something wasn’t quite right and, since there was another car following (Mr. H’s) he decided to wait and see if they stopped at the “accident.” As the car following accelerated after passing the clearing, so did he, and arrived in Kimba first. Constable Summerton then took us out to the clearing he had inspected on that night. The clearing itself was semi-circular, about one hundred metres across. It was clearly visible from the roadway once you were level with it, but not when approaching it. The following side was fairly open and would fit in with the young woman’s description of being able to turn back to have a look. We conducted a rigorous search of the ground and the trees and scrub. No marks, depressions, burns, or rope marks on trees, were revealed. However, it should be remembered that we were there four weeks after the event, and there had been rain in between. All in all, we were left with the impression that some real event did indeed occur, and that it was so unusual that not one of the witnesses decided to stop and have a closer look. This was a great pity because, if they had, it would no doubt have given us a wealth of other details. I located RAAF papers about the case on National Archives of Australia file series A703 control symbol 580-1-1 part 21. There was a report dated 5 Feb 1973 by Constable Summerton to the OIC No 21 Division of the South Australian Police. 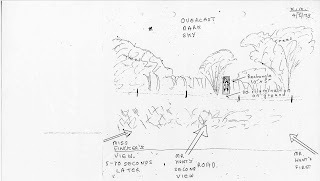 This report, together with a map, and a sketch of the "entity" as drawn by Mr H. made its way from Police Headquarters to the local RAAF base and thence to the Department of Air. Unusually, RAAF Headquarters asked Police Constable Summerton for additional information. This usually occurred when the case was mystifying to Headquarters, and the case seemed to challenge them. 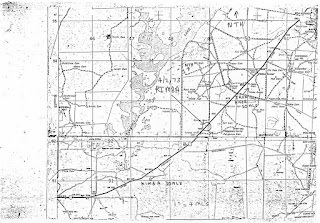 What did the RAAF think caused the event? 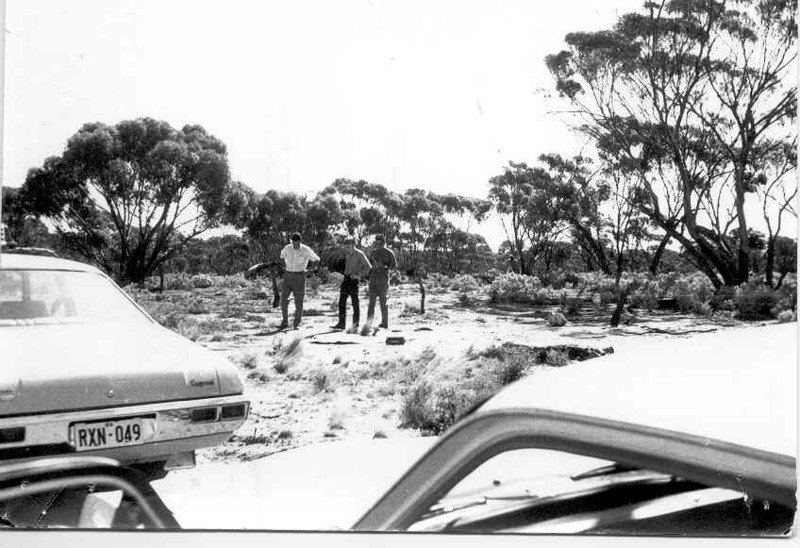 In a letter dated 2 May 1973, from C J Odgers, Director of Public Relations, RAAF, to Constable Summerton, the RAAF official conclusion on the case was "...the investigating team has been unable to conclusively determine the cause...a possible theoretical cause is a sighting of the phenomenon known as IGNIS FATUUS - methane gas released from decaying vegetation and spontaneously ignited..."
For information on "Ignis Fatuus" otherwise known as swamp gas - click here. The Kimba event occurred in an arid part of South Australia in the hottest month of the Australian summer, in an area totally devoid of swamps, bogs and marshes. The case intrigues me still, 41 years after the event. I had a compass with me at the time on site, but did not notice any anomalies. You have jogged my memory now. I seem to recall that in the book "Hunt for The Skinwalker"by Colm Kelleher and George Knapp they recount the following. Some scientists at night watched as a bright light turned into what they described as a tunnel, and an entity came through it and dropped to the ground. I will have to look up this account to read it again. New book alert - "The UFO Singularity." Where do you fit into the scheme of things?